204 pages | 50 B/W Illus. Lycopene is a potent antioxidant carotenoid found in fruits and vegetables; particularly high amounts exist in red tomatoes. It is not an essential nutrient for humans, but can be a potential therapeutic agent for preventing several human diseases. Since the publication of the previous book on lycopene, extensive advances have been made with respect to the role of lycopene and tomatoes in human health. 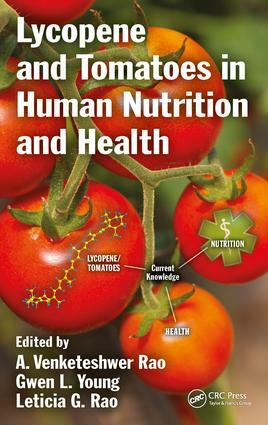 Whereas the initial focus of research was on cancer, Lycopene and Tomatoes in Human Nutrition and Health represents the next major step in documenting advances in understanding the chemistry, bioavailability, metabolism; mechanisms of action of lycopene; and its role in preventing human diseases other than cancer as discussed in the various chapters of the book. The book includes chapters that discuss genetic polymorphisms; and lycopene’s relationship to cardiovascular diseases, cardiometabolic diseases, bone health, and other health disorders including male infertility, skin diseases, respiratory disorders and neurodegenerative diseases. The book includes information addressing regulatory aspects of natural health products and, in particular lycopene, presenting industrial insights. The contents of the book are selected carefully to provide the readers with the most current information available on lycopene and tomato bioactives. Lycopene: chemistry, metabolism and bioavailability. Genetic polymorphisms associated with blood concentration of lycopene. A possibility of the relationship between tomato, lycopene and high density lipoprotein cholesterol level. Lycopene, tomatoes and cardiovascular diseases. Modulation of inflammation by tomatoes and lycopene in the context of cardiometabolic diseases. Lycopene and bone health. Lycopene, tomatoes, and male infertility. Lycopene and tomatoes in the prevention and management of other human diseases. Lycopene and tomatoes: An industrial perspective. Lycopene: regulatory status on its antioxidant health claims. Dr. A. Venketeshwer Rao, Professor Emeritus, Department of Nutritional Sciences, Faculty of Medicine, University of Toronto, has established a major focus in the area of diet and health His research has focused on the role of oxidative stress and antioxidant phytochemicals in the causation and prevention of chronic diseases, with particular emphasis on the role of carotenoids and polyphenols. He is one of the pioneering researchers to study the bioavailability, metabolism, mechanisms of action and biological role of lycopene, a carotenoid antioxidant present in tomatoes, tomato products, other fruits and vegetables and nutritional supplements. He is credited for bringing international awareness to the role of lycopene in human health. His research interest also includes the role of prebiotics and probiotics in human health. He has over hundred publications in scientific journals and several books and book chapters. He has a distinguished academic career spanning over 52 years. He is popularly sought by the international media to express his opinions on the subjects of nutrition and health. Ms. Gwen L. Young is a world recognized leader in advocating and promoting tomato and tomato product academic research and promoting science based healthy foods, diets, and access for all. She is president of the Tomato Foundation where she educates and inspires lifestyle as medicine and aims to reduce the incidence of diet related diseases and promote access to healthy plant based foods. She is also the Chair of the Tomato and Health Commission at the World Processing Tomato Council and is responsible to analyze and promote scientifically valid global academic research published on the health benefits of tomatoes and tomato products. Additionally, as a member of the science committee for ISHS she has provided scientists worldwide opportunities to present and publish their research and obtain research funding. Gwen completing her BS and MS degrees in Food Biochemistry / Food Science at UC Davis and also spent the next 25 years directing product development, marketing, culinary arts, quality assurance, and scientific advising for Nestle Brands and Kagome Inc.
Dr. Leticia G. Rao is an Adjunct Professor of Medicine and a full member of the Graduate Faculty, Institute of Medical Sciences, at the University of Toronto. She is the Director of the Calcium Research Laboratory and an Emeritus Scientist at St Michael’s Hospital, Toronto, Ontario. Her postgraduate degrees include a M.Sc. in Food Science from Oregon State University and a Ph.D. in Biochemistry from the University of Toronto. Her expertise is in the area of bone cell biology and calcium metabolism, and her long term research goal is to uncover the causes and prevention of osteoporosis by studying bone cells in the laboratory. She has extensive basic research experience on drugs that have been approved for osteoporosis prevention and treatment such as raloxifene and estrogen. She has conducted clinical studies on postmenopausal women to delineate how the fat-soluble carotenoid antioxidant lycopene present predominantly in tomatoes and tomato products and the water-soluble antioxidant polyphenols in natural food supplement can help in the prevention of risk for postmenopausal osteoporosis. She has presented her research data and has been invited to give talks on her clinical research on osteoporosis to a number of international symposia. Her publications in peer reviewed scientific journals are extensive. She co-authored a book entitled "Bone Building Solution" and co-edited the books "Phytochemicals – Isolation, Characterization and Role in Human Health" and "Probiotics and Prebiotics in Human Nutrition and Health." Although presently retired, she still holds the academic position both at the University of Toronto and St. Michael’s Hospital, and is actively presenting her data to International Scientific Symposia.